Ieso Digital Health, the UK’s leading provider of online talking therapy (CBT), is urging men to seek help and not to ignore their anxiety or depression over the festive period. With the Christmas onslaught underway, many men will be experiencing a combination of excitement and trepidation. Even those who love Christmas will admit to feeling more emotional pressure from financial worries, family conflicts or even feelings of isolation. But for those suffering with anxiety and depression, the festive season can be a particularly challenging time. · During the 2014/5 festive period the number of men seeking help from Ieso Digital Health for depression and anxiety spiked increased by 41% compared to an average month. 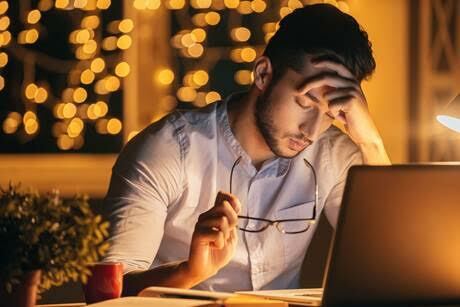 · These statistics are supported by a report conducted by the Samaritans, which shows the Christmas holidays are associated with higher levels of male depression: 48 per cent of men admit feeling low in December with 45 per cent saying their worries were the most troubling during the festive period compared to any other time of the year. · Men in the UK are three times more likely than women to take their own lives with most of those victims aged between 40 and 44. · Male suicide also increases in the days following Christmas. Ieso Digital Health provides discreet one-to-one therapy, delivered in real time using written (typed) conversation, with an accredited cognitive behavioural therapist in a secure virtual therapy room. Delivered at a time and location that is both convenient and comfortable, Ieso online CBT combines the gold standard, psychological intervention for treating depression and anxiety – CBT with leading edge technology, making it accessible online and affording patients greater transparency, great accessibility and increased privacy too. “We know that men with depression and anxiety are much more likely to bottle up their feelings compared to women and suffer in silence. Online Cognitive Behavioural Therapy is confidential, and available outside traditional office hours making it more accessible for men. The Ieso online method means that therapist and patient don’t actually see each other and communicate onlineand this enables patients to express themselves more openly and honestly, allowing more time to process the content than verbal communication would. Ieso Digital Health, is a globally recognised health tech leader providing digital cognitive behavioural therapy (CBT). The company is having a major impact in helping the NHS reach its challenging goals in mental healthcare delivery in the UK. · Working in partnership with the NHS, Ieso Digital is revolutionising accessibility, affordability and quality of mental healthcare in the UK by providing online talking therapy (CBT) for people dealing with common mental health conditions such as depression, anxiety, post-natal depression and social anxiety. · Ieso technology connects patients with accredited CBT therapists across the UK, removing the need for face to face therapy, putting the patient in control and enabling them to access Online Talking Therapy at a pace and place that suits their schedule, removing major barriers such as stigma, geography and access out of hours. · The effectiveness of Ieso Online Talking Therapy has been demonstrated in a successful clinical trial published in the Lancet. Ieso can also provide treatment for up to 44% less cost. · With one in four people in the UK affected by mental health conditions and one-third of GP appointments related to mental health concerns, intelligent and highly innovative technology platforms like Ieso Digital Health can play a huge role in delivering care where it is urgently needed. · CBT is the recognized gold standard, evidence-based, psychological intervention for common mental health conditions in the UK and USA and Ieso Technology uses analytics and clinical measurements to report back on progress. · Ieso can be accessed from all devices—including mobile, tablet and desktop. · The use of technology and written conversation improves patient choice and offers widespread access to effective, evidence-based, therapy. Ieso treats patients dealing depression and anxiety disorders. · Since 2011, Ieso Digital Health has received investment from Imperial Innovations, Cambridge Angels, Harvard Business School Alumni Angels, and Ananda Social Venture Fund.